The first legal hanging in Alberta, Canada, took place on this date in 1879. Generations later, it’s still remembered as one of the province’s worst, and strangest, crimes. 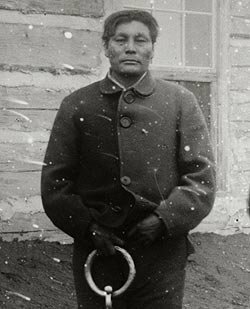 The hanged man was a native Cree known as Swift Runner (Ka-Ki-Si-Kutchin) — a tall and muscular character with “as ugly and evil-looking a face as I have ever seen,” in the words of an Anglo Fort Saskatchewan officer. Whatever his comeliness, Swift Runner was on good terms with the frontier authorities, who trusted him as a guide for the North West Mounted Police. That is, until the Cree’s violent whiskey benders unbalanced him so much that the police sent him back to his tribe … and then his tribe kicked him out, too. He took to the wilderness to shift as he could with his family in the winter of 1878-79: a wife, mother, brother, and six children. But only Swift Runner himself would return from that camp. When police were alerted to the suspicious absence of Swift Runner’s party, the former guide himself escorted investigators to the scene. One child had died of natural causes, and was buried there. They had all been gobbled up by a wendigo. The wendigo (various alternate spellings, such as windigo and witiko, are also available) is a frightful supernatural half-beast of Algonquin mythology, so ravenous it is said to devour its own lips — and human flesh too. For some quick nightmare fuel,* try an image search. The revolting wendigo was mythically associated with cannibalism, so closely that humans who resort to anthropophagy could also be called wendigos. According to Swift Runner, the ferocious spirit entered into him and bid him slaughter and eat all his relations. The disorder, whatever it was, was nevertheless surely bound to the precariousness of life in the bush; wendigo cases vanish in the 20th century as grows afflicted populations’ contact with the encroaching sedentary civilization. 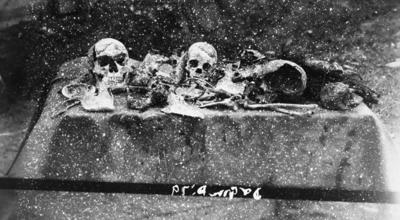 For Canadian authorities in 1879, however, there was no X-File case or philosophical puzzle: there was a man who had shot, bludgeoned, and/or throttled his whole family and snapped open long bones to suckle on their marrow. * In the Stephen King novel Pet Sematary (but not in its cinematic adaptation) the master adversary behind the reanimation of murderous household pets is a wendigo. For a classical horror-lit interpretation, Algernon Blackwood’s 1910 The Wendigo is freely available in the public domain. ** Cited by Robert A. Brightman in “On Windigo Psychosis,” Current Anthropology, February 1983.